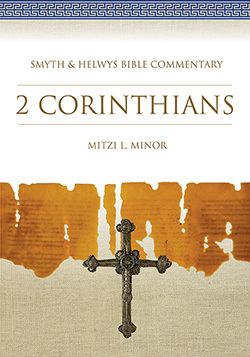 Mitzi L. Minor’s commentary on 2 Corinthians takes the reader deep into the thought world of Paul and his congregation at Corinth, exploring the social and theological tensions that shape Paul’s relationship with the Corinthian Christians. His letter expresses his joy that prior “severe” correspondence had been positively received and addresses the issues that were tearing the church apart; for one, false teachers who were sowing discord and maligning Paul’s character. Paul finds as well that many Corinthian Christians have repented of their rebellion, and he encourages them even as he seeks to vindicate his apostleship to those who challenged him. Minor encourages the reader imaginatively to enter the radically new ekklesia that was the earliest Church, not a body of like-minded and similarly stationed citizens, but a novel collective of diverse people and interests, never joined before, struggling together to discover the ways of God in a world completely overturned by the advent of Christ. Mitzi L. Minor, a native Alabamian, graduated from Auburn University and attended Southern Baptist Theological Seminary, Louisville, where she completed her MDiv and PhD in New Testament. After several years in parish ministry, she became chaplain and professor of religion at Bethel College in McKenzie, Tennessee. She was ordained by the Cumberland Presbyterian Church in October 1991 and in 1993 joined the faculty of the Memphis Theological Seminary, where she is professor of New Testament. Her vocational focus has been the intersection of Holy Scripture with our lives of faith. She’s written articles on feminist interpretation and women’s spirituality, and two books on Mark’s gospel that reflect this interest (The Spirituality of Mark: Responding to God and The Power of Mark’s Story).